Home Attractions & Days Out	What’s it like to ride The Slide (the world’s longest & tallest tunnel slide)? What’s it like to ride The Slide (the world’s longest & tallest tunnel slide)? So the kids were up for it of course (no surprise there), but VIP wasn’t keen. Too late – I’d booked a family ticket for four. We were allocated a time – 12.30pm and I was to meet the rest of the Wright clan there as I was working in London earlier that day. I had no trouble getting there – I took the Central Line to Stratford and it was a few minutes walk from the station. VIP on the other hand, had quite a bit of bother. He had walked down to the bus stop with a view to coming in by train and tube (we live in Kent), but when he got to there he realised that he didn’t have our son’s 11-15 Zip Oyster Photocard. Being the honest sort, instead of claiming that our son was 10 (he’s 11), he asked if he could swipe his oyster card twice to pay for him. Sadly, it doesn’t work like that and the bus driver wasn’t the sympathetic sort either, so VIP had to trundle back home, kids in tow. By the time he got back, time was ticking on, so he decided to jump in the car and drive. Not a great idea. Calling me in a panic (and missing our slide time) he was trying to locate the car park for the Queen Elizabeth Olympic Park. The learning lesson here folks, is that there isn’t one. To cut a long story short, I eventually found someone in the park who could help him and handed over my phone so he could tell VIP where to look for parking – it ended up being the Westfield Shopping Centre. When we returned (two hours and 40 minutes later) it came to £6.50. The guy told me that the park “was a public transport park only” and that there was no allocated parking. So be warned. While VIP was parking I managed to get myself to the ArcelorMittal Orbit's welcome desk to change our ride time – fortunately, they were very understanding and this went without a hitch. 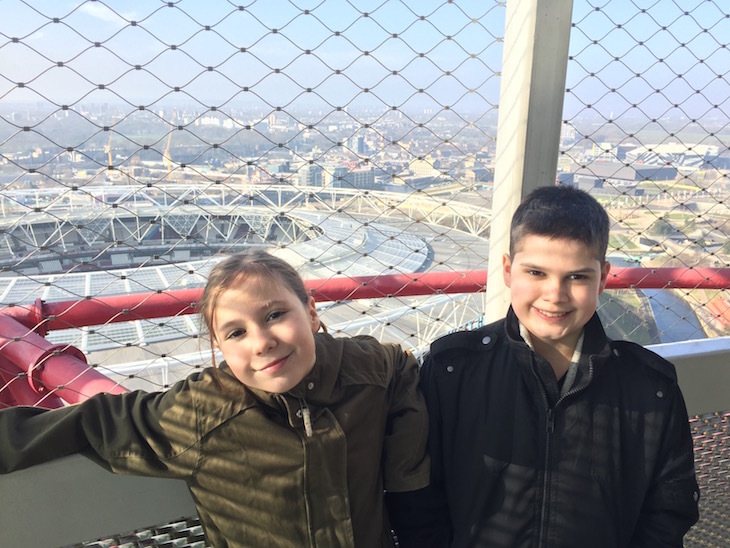 Now that we had a later ride time, we decided to take in the views over London from the 80m high viewing platform – right at the top of the ArcelorMittal Orbit – which features an outdoor observation walkway. Up we went in the super fast lift or, if you’re feeling active, you can always opt for the 455 stairs! On a good day you can see for up to 20 miles. The visibility was good on the day we visited, but not crystal clear. We could see the city and it was great to look down at The Stadium and nearby landmarks which are clearly signed on the platform so you know what you’re looking at. The viewing platform also features giant concave mirrors – which the kids loved, while VIP and I were taken with the interactive touchscreens. 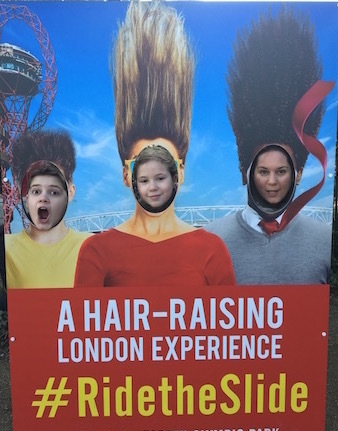 After watching people ride The Slide (it takes around 40 seconds to get from the top to the bottom of the 178m tunnel slide! ), we were raring to go. Well, I say ‘we’ – Luis (my son) and I were really excited, VIP had reservations and Nadja (age 9) was just plain scared. It’s funny what goes through kids’ minds isn’t it? She asked ‘What if the slide breaks when I’m inside?’. After plenty of reassurances and a gung-ho attitude from myself (hoping she’d follow suit), she seemed to come round to the idea. You have to be eight years old (and at least 1.3m tall) to ride the slide (you wear protective gear – a helmet and elbow pads and have to get into a sack). You also have to keep your head up off the sack at all times. I guess they put the minimum age at eight as they need to be able to follow instructions and keep hold of the sack at all times. So I volunteered to go first – and I loved it! I whooped and laughed for the full 40 seconds, delighting at being thrown from side to side, going from pitch black to bright lights and enjoying a couple of thrilling drops as well as a tight corkscrew named ‘the bettfeder’ – bedspring in German. It was over quicker than I wanted it to be and I’d have happily gone straight back up for another slide, or three. No sooner had I got off when I heard Luis coming down after me – he made lots of high-pitched screams (he’d call them shouts) and came out the other end laughing. It was then that I decided to race to the locker to get my phone to try and get Nadja coming out on camera. If you watch the video (below) you’ll see that I just managed to get her as she came out the tunnel. Even VIP enjoyed it. He was mostly concerned with getting bumped and bashed (and bruised) from being flung around, but the protective gear helped prevent any scrapes. All of us would have gone back up for a second go (a second ride costs £5), but the kids were starving and I had to get back to work, so we nipped into the nearby café to grab and sandwich before heading back to the shopping centre to play ‘find the car’. Although the main purpose of our day in the park was to ride The Slide, there are plenty of other things to do and attractions to see, so if you wanted to you can make more of a day of it. Examples include checking out the nearby funfair, going on a exploration trail through the landscaped gardens, watching the kids play at one of the adventure playgrounds, grabbing a bite to eat or a drink at one of the many cafes and enjoying an inflatable AquaSplash water obstacle course at The London Aquatics Centre. 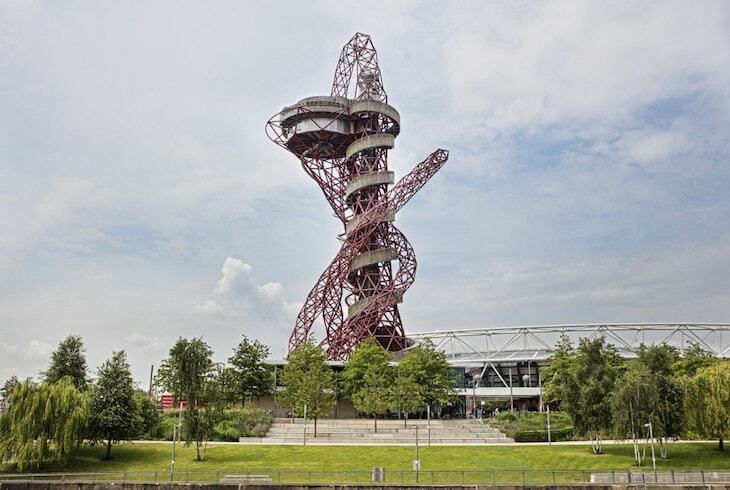 Combined ticket prices for the ArcelorMittal Orbit and The Slide when bought in advance are £15 for adults, £10 for children, £46 for a family of four and £12 for seniors and students. Tickets for The Slide are issued in 15 minute timeslots and are valid for one use of The Slide. Additional tickets can be purchased for £5 on the day. We absolutely love visiting the Olympic Park and have such good memories of the Orbit. When we went in January, we met Tom Daley at the top while our daughter was swimming in the Olympic Pool. That’s amazing Helen – love Tom….must have been great to meet him! Aww that looks like so much fun! Scary but fun hahaha!! I would love to ride the slide. I am sure I would have so much fun! Oh wow this looks so amazing! What fun – my boys would love it! wow what an awesome slide!!!! My kids would be far too scared haha lovely to hear that you enjoyed it! Oh my goodness! I totally love adrenaline rides! makes me forget about the reality and just scream and shout. Indeed a lot of fun! I love thrill rides – I’m still like a big kid! I don’t blame your daughter for being scared! I would be too, but how amazing that she did it and you all loved it! The views are great! I never knew that you could see as far as 20 miles. Wow. That’s fantastic Rhian – you’ll love it! Looks like fun! Unfortunately my fear of heights wouldn’t allow me the pleasure. Omg I’d be terrified I’d love to do it but I’d be far too scared too . oh my lord. This is my idea of hell! I think you’re so brave for doing this. I don’t think I’d be able to even get to the top to start the slide down. My OH on the other hand would LOVE this! I live nearby and I still have not managed to have a trip to the slide yet and I really want to! Maybe when it is warmer! OMG!!! I’m terrified just looking at it. I am sure that the view was great from up there although I know I’d never make it that high myself. I had no idea this even existed!!! Looks fun but a bit pricey! Thanks for the heads up on how to get there. Oh I feel I am far too much of a wuss for this!!! Ha! Looks like a fab and fun day though! It sounds like great fun! Did you think the tickets were a fair price for what you experienced? The tickets are quite pricey but I guess it’s a once-in-a-lifetime opportunity to experience and the ticket price reflects this. Thanks Sarah – she was definitely up for another go! Definitely! Thanks Jodie – it’s nice to create memories to look back on…! Thanks Caroline – it was great fun! It sounds like great fun – shame it was over so quickly! I think you should definitely get a couple of goes for the cost (but I’m very Northern so I would say that haha!). Glad you had a good day despite the travel issues though. Video coming in a mo .. ?